One of three loaves was removed from the fermenter set at 31C after 24 hours. The soy beans were wrapped in a cotton cloth which is used again after microwaving to sterilize. The cloth gets stained heavily. I usually extend the fermenting period to 36 hours, but the tempeh is now ready for use. The metal molds are perfect for fermenting. Five hundred ml of beans are processed in a batch. 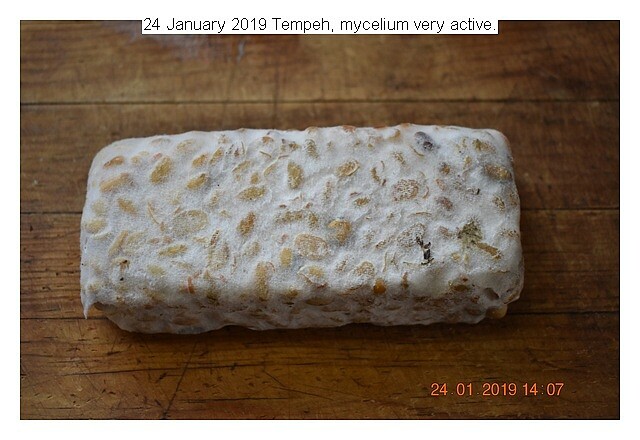 This entry was posted in Uncategorized and tagged 24 January 2019 Tempeh, Tempeh 24 hour incubation Soy. Bookmark the permalink.